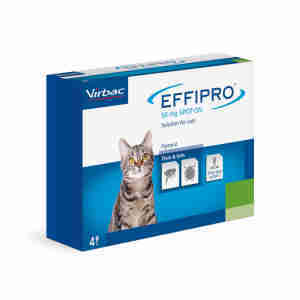 Effipro Spot On for cats is an effective treatment for the prevention of fleas and ticks. The treatment comes in an innovative ‘drop free’ pipette, so even if you accidentally drop it, the liquid won’t spill out. Each application of Effipro Spot On lasts at least 4 weeks for fleas and 2 weeks for ticks. Your cat should be treated with a spot-on treatment at regular 4 week intervals to keep them protected. Effipro will kill fleas within 24 hours and ticks usually within 48 hours. If your cat already has fleas, it is recommended that you treat your home to stop re-infestation. Please be aware that this medicine can only be supplied for a maximum of one year treatment per animal. To ensure that you read the most up to date information about this product, please check the VMD's Product Information Database. One 0.5ml pipette contains: Fipronil (50 mg), Butylhydroxyanisole (E320), Butylhydroxytoluene (E321). The product should not be used on kittens less than 2 months old and/or weighing less than 1 kg. Administer at the first sight of fleas and/or repeat every 4 weeks to keep your dog protected from fleas. Always use this works with no side effects and considerable cheaper than buying from the vets. Definitely recommend.